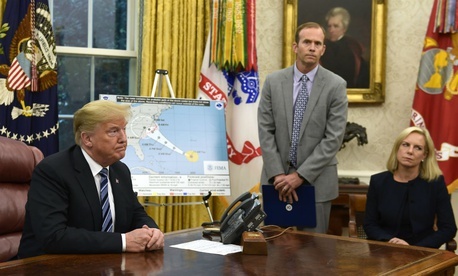 In a case of unfortunate timing, Federal Emergency Management Agency Administrator Brock Long on Thursday had to take time out from preparations for Hurricane Florence to address reports that his personal travels in government vehicles are under investigation by the Homeland Security Department’s inspector general. As first reported by Politico, Long’s regular weekend road trips to his home state of North Carolina have raised questions about whether he is improperly billing taxpayers, according to three unnamed current or former administration officials. The trips are said to include staff member and hotel expenses, and one black Suburban used by Long was reportedly involved in an accident. A spokesman at the DHS inspector general’s office would not confirm the story to Government Executive, but noted a barrage of press inquiries. Homeland Security Secretary Kirstjen Nielsen called Long on the carpet about the issues last month, and may have requested his resignation, according to news reports (the sources differ on the resignation request). Extravagant travel expenses helped lead to the resignations of Trump Health and Human Services Secretary Tom Price and Environmental Protection Agency Administrator Scott Pruitt. Long told reporters Thursday, "Every day we work closely with the OIG and the [Government Accountability Office]" and "we'll continue to fully cooperate with any investigation that moves forward,” as reported by USA Today. "I would never intentionally run a program incorrectly. If we made mistakes with the way a program was run, then we’ll work with OIG to get this corrected. Doing something unethical is not part of my DNA and it’s not part of my track record in my whole entire career." Former officials noted that the FEMA administrator travels with aides to remain available for emergency communications. Former FEMA chief Craig Fugate told Politico he could remember using government cars for commuting purposes only in seven instances during his eight years there under President Obama.